In September of 1957 — way back when that much-missed hyphen was still in “Neiman-Marcus” — Stanley Marcus invited Coco Chanel to Dallas to accept the Neiman Marcus Award for Distinguished Service in the Field of Fashion. Mlle. Chanel had never been to Texas, but her visit here was a meaningful one. Following a 15-year retirement, her re-emergence as a designer in the early 1950s was met with mostly derision by the French press. The American response, on the other hand, was very different. It was because of the enthusiastic reception that her work received from American retailers (such as the even-then legendary Neiman Marcus department store) that she had been able to bounce back and, once again, be considered a force in the fashion world. When she was invited to Dallas to receive the “Oscar” of the fashion industry, Mlle. Chanel was happy to accept. 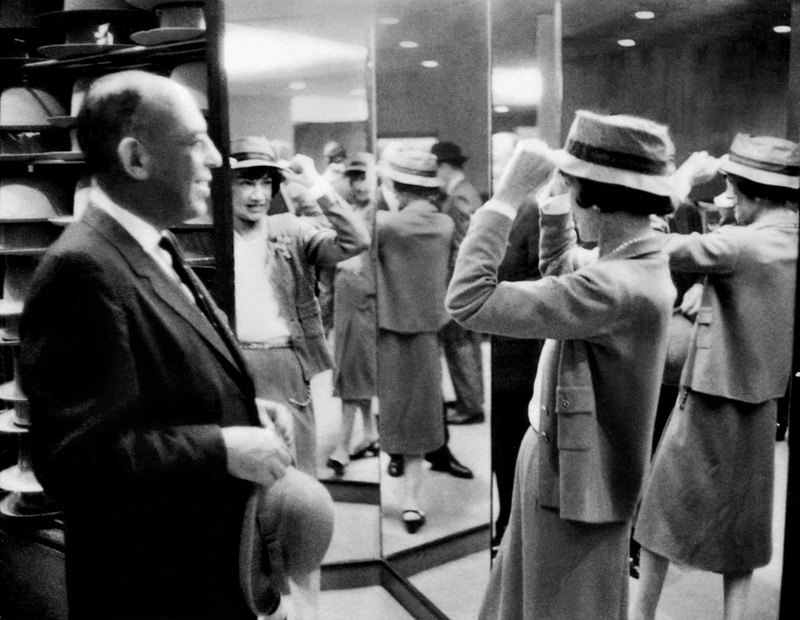 In the photo above, Coco is seen trying on hats at the downtown Neiman’s store as Mr. Stanley stands by beaming. On her Dallas visit she was also treated to a ranch barbecue (!) where she was photographed watching both a square dance (!!) and a … oh god … Chanel-themed bovine fashion show (!!!). Mlle. Chanel seemed to love the cows-in-ropes-of-pearls runway show, but she was not a fan of the barbecue and beans — she (one hopes discreetly) dumped the contents of her plate onto the ground under the table … right onto the shoes of dining companion Elizabeth Arden (whose shoes may have been ruined, but who had a truly great story to tell for the rest of her life). From all reports, everyone seemed to enjoy (and no doubt profit) from the successful visit. Karl Lagerfeld, the current creative director of Chanel, recently brought Chanel back to Dallas (both figuratively and literally) with the house’s important Métiers d’Art fashion show which was held at Fair Park in December, 2013. The following day, Lagerfeld was presented with the Neiman Marcus Award for Distinguished Service in the Field of Fashion — just as Coco Chanel had been, 56 years earlier. And the haute-couture circle-pin of life keeps on rolling. Top photo by Shel Hershorn for the AP. From the Briscoe Center for American History, University of Texas at Austin. N-M ad from 1957 (portion of a larger ad). Chanel’s thank-you telegram to Marcus, from the collection of Stanley Marcus’ Papers at the DeGolyer Library, Central University Libraries, Southern Methodist University. More photos of Mlle. Chanel in Dallas (along with text of a DMN article on the visit) can be found here. Even more photos (bovine fashion show…) and a really great post from SMU’s “Off the Shelf” blog is here. Video of the 2013 Chanel runway extravaganza (Métiers d’Art), held in Fair Park’s hay-stewn Centennial Hall, can be watched here. A shorter video with a few cursory shots of the Dallas skyline and Fair Park can be seen here. For more on the first French Fortnight, see my post “Neiman-Marcus Brings France to Big D — 1957,” here. Copyright © 2014 Paula Bosse. All Rights Reserved.